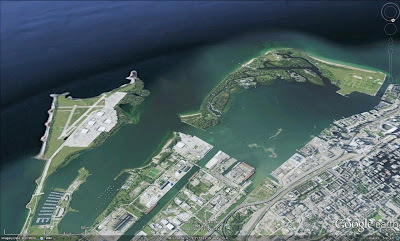 In my original post "Moving the Toronto Island Airport" I re-proposed the idea of moving the Billy Bishop Toronto City Airport to the end of Leslie Street, the current site of Tommy Thompson Park. The extension to the existing airport runway to accommodate jets had yet to be proposed when I wrote the first post. With Porter's proposed runway lengthening, the argument is even more powerful to relocate the airport. The red lines denote where the runways end currently. These extensions would pretty much end any possible expansion or redesign of the airport while addressing zero of the current problems with the existing airport design and location. The end of Leslie has ample room for the existing airport with the runways extensions, not to mention it is on the mainland and accessible by road. With the construction of the new Leslie Barns for the TTC, the Leslie Street airport would be incredibly handy for streetcar access as well. There is quite a campaign now from those both for and against the airport expansion. I think there is an alternative. Contact your city council member and let them know your views. And if you happen to think moving the airport is a viable alternative, at least one that should be explored, let them know that too and send them the link to this blog. Copyright © 2012-2013 James Latimer. All rights reserved.. Simple theme. Powered by Blogger.